As a CIO in today’s fast-paced world it has become increasingly difficult to stay on top of all the relevant news and information I need to be successful in my job. The days of reading a local newspaper, subscribing to a few trade journals, magazines and watching the news to keep up are long gone. Similarly, surfing the web to try to keep up with everything is not a viable option as it just takes too much time and it is too easy to get trapped in a rabbit hole of non-productivity. So, what is the modern way to keep up? I have found using Feedly is the best way to keep on top of all the news and developments I need to be successful in today’s business and technical world. With Feedly I can scan hundreds or thousands of articles from dozens of different sources quickly and efficiently. Feedly dramatically reduces the friction in information consumption. With Feedly I can quickly scan RSS (Really Simple Syndication) headlines to determine which ones I want to click on to get more information. Once I click on a particular item of interest, I get a short synopsis of the article and any accompanying pictures. 9 out of 10 times, this snippet/picture combination is enough to convey the relevant information so I do not have to click on the link to actually read the original article. This is the key to the massive time savings I get by using Feedly to process incoming information. Feedly is free and it is very powerful. A paid version, Feedly Pro has the features you really need to fully experience the full productivity boost. A subscription to Pro costs $5/month or $45/year and it is worth every penny. It is available on the web, Android, Blackberry, Chrome, iOS, Kindle, OS-X, Windows 8 and Windows Phone. That pretty much covers it from a devices perspective. Choosing feeds is easy. Just search Feedly for your profession/career, your favorite people, your interests, your hobbbies, your passions, your favorite brands, magazines and newspapers, etc. and it will list the feeds available on the subject. When choosing be sure to notice the number of subscribers and the number of posts per week. The more subscribers the better. More posts is not always a good thing. Some feeds are “spamy” and post too many articles relative to the overall value. My feeds or sources are handled in a very Darwinian way. If a particular feed is not providing relevant information I delete it. If a feed produces too many posts per day that are not relevant, I delete it. Frequently I subscribe to a feed to try it out only to decide it does not make the cut and is delete in a week or so. This results in a very fluid list of sources that is constantly changing. I currently subscribe to 81 feeds, which result in over 600 posts per day and I am able to process them in less than a half hour. This allows me to keep up on all the news and events from sources I consider relevant to my career and life. 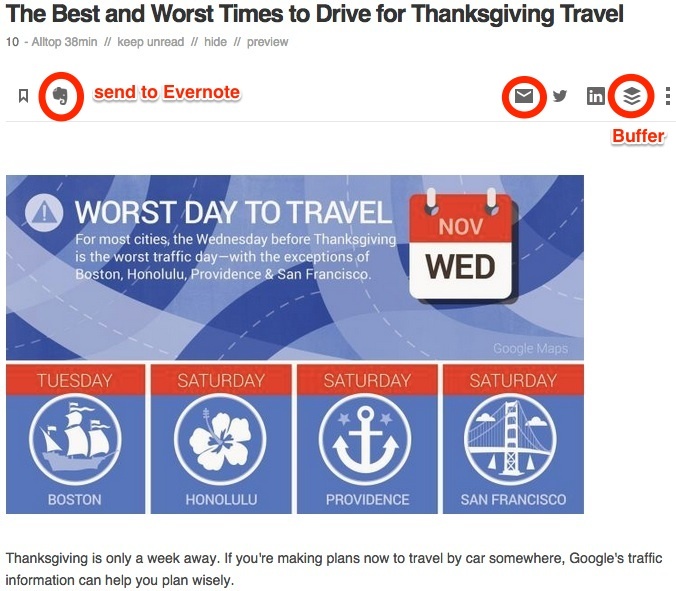 If I want to keep the article for reference or for some kind of follow up, then I just select the “ Evernote” button and it send it directly to Evernote to process later. This is one of the most important aspects of my overall GTD system. 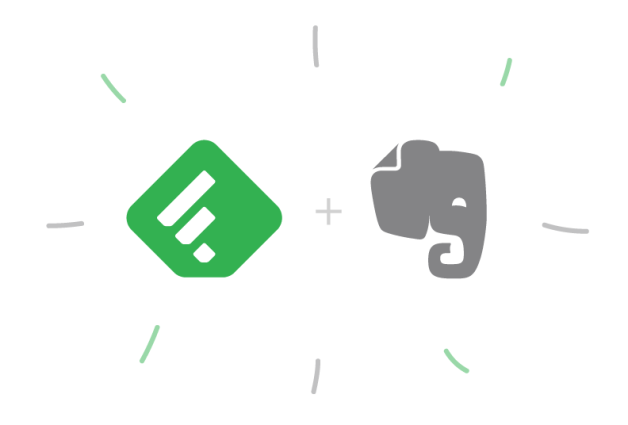 Processing in Feedly and sending to Evernote is a huge time saver. As I process, if the article is something I want to share with others I use the “Buffer” button which will tweet it on Twitter and post it to LinkedIn on a specified schedule. Sometimes, I want to email someone directly and all I have to do is select the email button. Simple. Efficient. Friction-free. The key to long-term success with Feedly is incorporating it into your daily habits. I usually process my feeds the first thing in the morning when I am at the gym on the elliptical trainer. It works out great because it has a reading stand for the iPad so I can easily use my hands to process my incoming queue of headlines while listening to an up-beat playlist of music. I also use Feedly on my iPhone and Nexus phones regularly. I pride myself on knowing information before others and daily processing of RSS feeds is the key to making this a reality. It gives me a competitive advantage in work and life. I am extremely impressed when a colleague tells me something relevant that I do not already know about. If it happens once in a while then it is just luck or timing but if they consistently know relevant information before I do, then it shows me they have an effective system for processing information and I try to learn how they do it. With Feedly, I can subscribe to a wide variety of sources and quickly scan what is going on in the world. How do you process information in today’s fast-paced world? A colleague of mine just got turned on to the power of Feedly and it got me thinking about RSS and it’s evolving role in my information diet. I have always been a reader and voracious consumer of information. I subscribe to numerous magazines and newspapers via Apple’s Newstand on my iPad. I love to read a good book via Kindle on either my iPad or my Kindle Paperwhite. I also listen to books on Audible on my commute and podcasts when I’m working out at the gym. But, it has become increasingly difficult to stay on top of all the relevant breaking news in today’s fast-paced world. Surfing the web to try to keep up is not a viable option as it just takes too much time and it is easy to get trapped in a rabbit hole of non-productivity. I have found using RSS feeds is the best way to keep on top of all the news and developments in order to be successful in today’s business and technical world. Many people have given up on RSS (Really Simple Syndication) feeds and it is definitely on the decline since Google dropped Reader. However, I still use RSS because I can subscribe to a wide variety of sources and quickly scan what is going on in the world. I consider this a critical part of my overall continual learning experience. 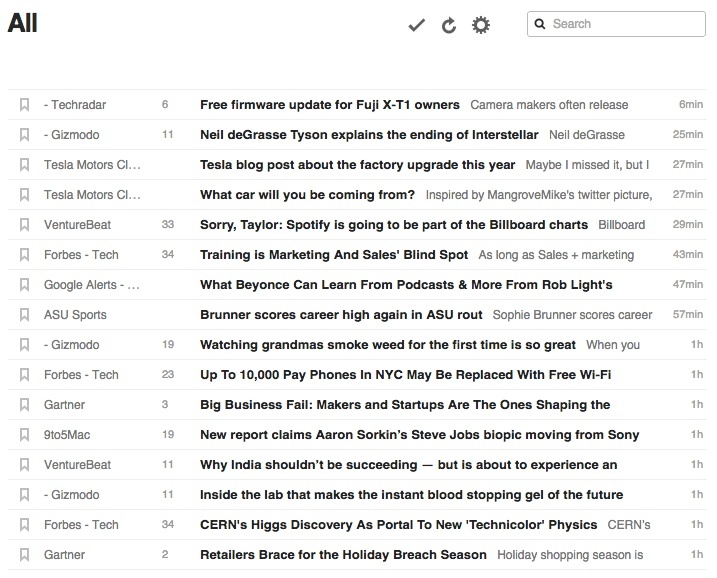 I treat my incoming RSS Feeds just like my email inbox and try to process all my feeds to zero every day. I have tried many RSS readers and since the demise of Google Reader, and now I use Feedly on all of my devices to consume RSS content. I do not use any of the “pretty” feed aggregators that try to make a custom magazine because it is just too inefficient for the volume of feeds I process every day. With Feedly I can quickly scan the headlines to determine which ones I want to click on to get more information. Once I click on a particular item I get a short synopsis of the article or post and then if I want to actually read it I click on the link and it takes me to the web site where I can read the original article. If I want to keep the article to read later or for some kind of follow up, I just select the “Send to Evernote” option to process later. If the article is something I want to share with others I use the “Send to Buffer” option to tweet it and post it to LinkedIn. I usually process my feeds the first thing in the morning when I am at the gym on the Precor elliptical trainer. I currently subscribe to 60 feeds which result in over 500 posts per day and I am able to process them in approximately 20 minutes. This allows me to keep up on all the news and events from sources I consider relevant to my career and life. I treat my feeds very Darwinian way in that if a particular feed is not providing relevant information I delete it. This results in a very fluid OPML file (OPML files are the list of RSS feeds a reader program uses) that is constantly changing. Frequently I subscribe to a feed to try it out only to decide it does not make the cut and is delete in a week or so. I also remove feeds that have dedicated iOS apps like Techcrunch, CNet News, The Verge, Boy Genius Report, Engadget, etc. because I prefer to view that content in the native app due to its optimized formatting. I pride myself on knowing information before others and daily processing of RSS feeds is the key to making this a reality. It gives me a competitive advantage in work and life. I am extremely impressed when someone on my staff tells me something relevant that I do not already know about. If it happens once in a while then it is just luck or timing but if they consistently know relevant information before me it shows me they have an effective system for processing information and I try to learn how they do it. How do you process information in today’s fast-paced world?